"Stagecoach" is a film in which two great careers were renewed. Although he had appeared before in many films, as an extra, a stuntman and then an actor in B films, this was John Wayne's first starring role in a film by John Ford. For Ford, it was a return after some years to a genre about which his ideas had grown--the genre in which he would make many of his greatest films. With Ford's clout as a director and Wayne's clout as a star, they would make iconic films and establish themselves as one of the legendary partnerships in cinema. They came together at a propitious moment in Ford's career. He was 45. He had directed his first silent films (ten of them!) in 1917. He had tasted great success, and won an Academy Award for directing "The Informer" in 1936. But now came his years of triumph. No director of the sound era made more great films more quickly than Ford did when he followed "Stagecoach" with "Young Mr. Lincoln" and "Drums Along the Mohawk," all three in 1939, and then made "The Grapes of Wrath" and "The Long Voyage Home" in 1940 and "Tobacco Road" and "How Green Was My Valley" in 1941, collecting in that period three nominations and two Oscars for directing. Ford had his eye on John Wayne from the days when he was called Marion Morrison, nicknamed Duke, and was a football player from USC, working summers at 20th Century-Fox. In the decade before "Stagecoach" Wayne worked in some 40 Westerns, from an extra to a lead, without distinguishing himself. Ford thought he had the makings of a star, and decided Wayne was right for the key role of the Ringo Kid in "Stagecoach." The studio was adamantly opposed to the casting; it demanded a name actor. "Pappy" Ford imperiously insisted. And Wayne made an impression that would change his life and one day win him a place on a U. S. postage stamp. Seen today, "Stagecoach" may not seem very original. That's because it influenced countless later movies in which a mixed bag of characters are thrown together by chance and forced to survive an ordeal. The genre is sometimes called the Ark Movie. The film at times plays like an anthology of timeless clichés. You will see a woman going into labor as a doctor orders, "Boil water! Hot water! And lots of it!" You will meet a prostitute with a heart of gold, and an evil banker, and a shifty gambler, and a pure-hearted heroine, and murderous Apaches, and a sultry Indian wife, and a meek little traveling man, and a chase scene with a stagecoach driver going hell for leather. You will see saloons, corrals, vast landscape, camp fires, and the U. S. Cavalry--which sounds the charge before riding to the rescue. 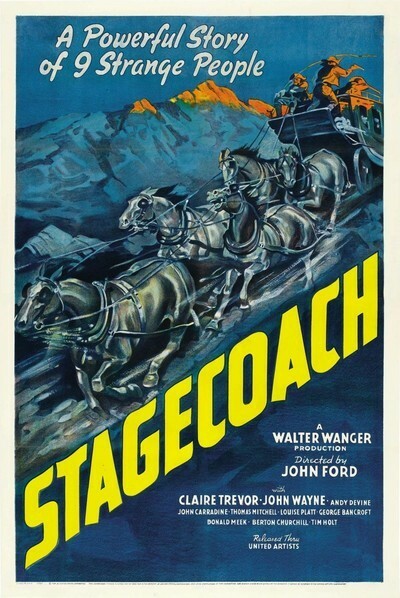 Trevor was a star, but Ford gave nearly equal weight to the other passengers in the stagecoach, all played by actors who would have been familiar to movie audiences: Squeaky-voiced Andy Devine as the driver, John Carradine as the elegant gambler, Thomas Mitchell as the alcoholic Doc Boone, Louise Platt as the pregnant soldier's wife, and Donald Meek as the effeminate Mr. Peacock, a traveling salesman who improbably wears a checkered deerstalker hat in the Old West. As they line up facing each other, the Ringo Kid sits on the floor between them, but Ford somehow never frames him to seem lower. Ringo Kid: "I still got a ranch across the border. There's a nice place--a real nice place... trees... grass... water. There's a cabin half built. A man could live there... and a woman. Will you go?" Dallas: "But you don't know me--you don't know who I am." Ringo Kid: "I know all I wanna know." The way Wayne says that embodies his effortless authority. He says it and you don't doubt he means it. Indeed, the impression he makes here suggests he was perhaps lucky to avoid such a high-visibility role earlier in his career. He was 32 when he made this film, tall and slim, and had outgrown the almost improbable boyish beauty of his youth. He could growl and take a position and hold his ground and not talk too much, and he always sounded like he meant it. Ford never makes the mistake of cutting so quickly that the sense and context of an action sequence is lost. The extended stagecoach chase always makes sense, and he allows his camera to be clear about the stunt work. Consider this extraordinary stunt: An Apache leaps from his own horse onto the stagecoach team, straddling the lead horses. He is shot. He falls between the horses to the ground, and the horses and stagecoach pass entirely over him. No CGI here; he risks his life. Wayne is the hero of the film, but not an "action hero." He was manifestly a bad man; the "Ringo Kid" doesn't get his picture on Wanted posters for nothing. But he never suggests evil, and seems prepared to be taken to prison even though he has many opportunities to escape. There is the suggestion he stays with the stagecoach because he is needed to protect its passengers, especially the two women. We see here Wayne's extraordinary physical grace and capacity for tenderness, and understand why Ford later cast him as "The Quiet Man." Two scenes in particular. Wayne in left foreground, leaning against a wall as he watches Dallas walk away from him down a corridor. Observe his body language. The way he looks after her and then straightens up and follows her. And later, look at Ford's lighting and composition as Dallas, in foreground in the moonlight next to a fence, stands alone and the Ringo Kid, in background, the smoke from his cigarillo back-lighted as a backdrop, approaches her. That was a studio shot. But much of the movie is shot on location in Ford's beloved Monument Valley, its prehistoric rock pillars framing the smallness of men. Ford returned again and again to the valley, where his casts and crews lived in tents and were fed from a chuck wagon; he valued the distance from meddling studio executives. He was a dictator, and in that vastness his word was law. The film's attitudes toward Native Americans are unenlightened. The Apaches are seen simply as murderous savages; there is no suggestion the white men have invaded their land. Ford shared that simple view with countless other makers of Westerns, and if it was crude in 1939 it was even more so as late as "The Searchers" (1956), the greatest Ford/Wayne collaboration. Only in his final film, "Cheyenne Autumn" (1964) did he come around to more humane ideas. Perhaps because of his long association with Wayne, Ford is often seen as a conservative. In fact he was an outspoken liberal, the standard bearer against Cecil B. DeMille's attempt to force a loyalty oath upon the Directors' Guild during the McCarthy witch-hunt. Ford was not a racist, nor was Wayne, but they made films that were sadly unenlightened. Within "Stagecoach," however, beats a humanitarian heart: None of the occupants of the coach is taken for granted or dismissed casually. They are all given full weight in their mutual dependence. This is a very civilized Western. A restored print of "Stagecoach" has been released on Blu-ray in the Criterion Collection. Also in my Great Movies series: Ford's "The Grapes of Wrath" and "The Searchers," and Wayne's "Red River" and "Rio Bravo."